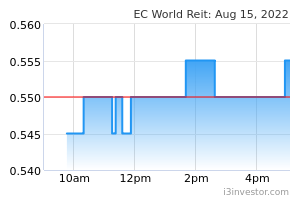 We do not have a rating on EC World REIT. We recently visited its assets in Hangzhou and noted EC World REIT’s strategic market positioning and the favourable logistics sector outlook. See asset details and visit notes in the PDF report attached. Key takeaway: master lease assets (70% of 2Q18 NPI) are ramping up steadily, with the sponsor likely to extend master leases – this could help sustain dividend yields. The assets also cater mainly to local demand and, contrary to market expectations, may potentially benefit from current trade tensions. This is due to the Chinese Government’s push to boost its domestic consumption. Logistics and e-commerce REIT, with a geographical focus in the People’s Republic of China (PRC). EC World REIT has seven properties under its portfolio: six are in Hangzhou, while another – acquired on 16 Apr 2018 – is located in Wuhan. The assets have a total NLA of 0.75m sqm, with the remaining land-lease tenures ranging between 35 and 47 years. Three of the seven (accounting for 61% of total value) are under master leases that expire in 4Q20. The port logistics segment is the biggest contributor to gross rental income, accounting for 47% of the total as at 1H18, as well as 33% of its portfolio’s NLA. The e-commerce logistics segment is the second-biggest contributor, making up 38% of the portfolio’s gross rental income with a 32% NLA. The specialised logistics segment – which makes up the most NLA (35%) in its portfolio – accounted for only 16% of gross rental income. EC World REIT’s properties have a diversified tenant base, with delivery, logistics & distribution, and e-commerce services accounting for the bulk (80%) of them. As at 1H18, the properties have a committed occupancy rate of 99.2%, with the underlying end-tenant occupancy of 96.7%. EC World REIT’s portfolio weighted average lease expiry by NLA and gross rental income stands at 2.4 and 2.5 years. EC World REIT owns seven assets in China that mainly cater to the e-commerce, logistics and supply-chain segments. They are valued at SGD1.4bn. Three assets are on master leases, and almost all leases have rent escalations ranging between 1% and 12%. 80% of tenants’s online retail sales hit CNY430.2bn in 2017 with a CAGR of 29.6% over 2013-2017. According to Colliers International, logistics facility rental rates in Hangzhou grew 3.4% pa between 2007 and 2016, and should grow at 45% over the next two years. Forchn (富春国际) is EC World REIT’s sponsor and has over 20 years of experience in port operations, e-commerce logistics, real estate, and financial services. The sponsor holds a majority 44% stake in a debt headroom of ~SGD300m (CNY1.5bn) for acquisitions. Forchn manages four private funds with EC World REIT. We believe potential acquisition targets are YCH’s 13 logistics assets and e-commerce properties in Fuzhou. Forchn non-executive chairman and founder Zhang Guobiao is also the executive vice chairman of the Zhejiang Chamber of Commerce. Independent director (ID) Chan Heng Wing (lead ID) is an ID with Fraser & Neave (SGX:F99) and Banyan Tree (SGX:B58). ID Chia Yew Boon previously worked at GIC and Boustead Singapore (SGX:F9D) while ID David Wong See Hong was a former Bank of China deputy CEO. The experienced board lends confidence in terms of corporate governance matters. Non-renewal of sponsor master leases, FX fluctuations (6-month rolling hedges), and any adverse regulatory/policy changes. High-yield gap presents room for yield compression. EC World REIT, currently the second-highest yielding S-REIT, is trading at an FY17 yield of 8.8%, a 210bps and 240bps spread above the industrial REIT and sector average. We believe the high yield is mainly on investor concerns over master lease expiries and trade war impact. There is scope for yield compression, as investors gain more clarity on the master leases and resilience of its assets.